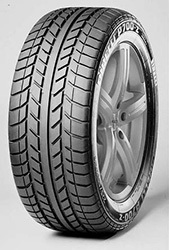 Large shoulder blocks and an ultra low profile give the Pirelli P700-Z the reputation of an ultra sporty perrfomance tyre. Designed to be used on sports cars and low coupes, the P700-Z not only looks good but it feels and handles fantsatic. The wide grooves in the tread pattern design offer up perfomance in both the wet and the dry that most manufacturers would be envious of. Not often found since the release of the P7 and the green perfomance range but if you can get your hands on it, snap some up, and you'll feel the benefit!